A floating wind turbine is an offshore wind turbine mounted on a floating structure that allows the turbine to generate electricity or pump water in water depths where bottom-mounted towers are not feasible. Further more, wind is more powerful over the sea in comparison to land. Though their are many ways we can use these turbines,but today we will see how we can use them for pumping water. Farmers around the world consumes large amount of fresh water for their farming.Not only that,at some places of Africa and Asia, their only source of fresh water is rain or tube wells.Farm Pond project, we discussed yesterday can help them to store rain water on their farm itself. Even though, farm ponds with drip irrigation solves the problem of water shortage for farmers but still they need to pump out this water for irrigation and light weight floating wind turbine pump can be used here. Pumping at farms usually done by traditional methods such as electric pump or diesel pumps.But as our focus is to make our farming green, we can use wind or solar powered pump discussed earlier on this blog. Though any of these methods can be used but floating wind turbine would be much better alternative, particularly for farm pond pumping. 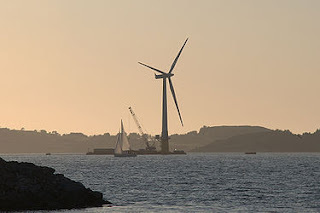 Its working is similar to traditional wind mills with only difference is its free flowing nature.It base is not fixed and it floats and changes its direction according to wind.